A student has survived for eight nights on a mountain in Turkey by eating insects and sheltering in a cave. David Mackie, 21, from Nottinghamshire, and his two Dutch friends went missing after bad weather and flooding in the Antalya area. Mr Mackie, who is studying in Istanbul, was found on Monday and airlifted to hospital. He has no serious injuries. 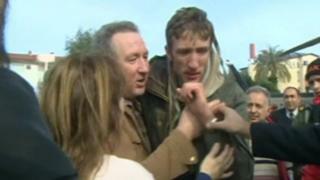 His sister Hannah Mackie, 22, said the family were still in shock over what happened. She said: "It's been the worst week of my life... we're so relieved, we're still in disbelief. "You don't think it's going to happen to you." Mr Mackie said: "I've not eaten for seven days now. We ate a few ants and things like that and drank spring water from the mountains. "We are extremely hungry and exhausted." The engineering student left for a day trip with two Dutch friends, hiking along the Lycian Way long-distance path in Antalya, on 11 January. However, they got lost, and due to bad weather and flooding were left without shelter until they found a cave to sleep in. Mr Mackie's family grew worried when he had not been in contact and missed his flight back to Istanbul. He managed to make an emergency call on Friday and the search for him began. Ms Mackie said hundreds of people searched the canyon for her brother and his friends, who managed to survive by drinking spring water and eating insects. He was rescued by helicopter on Monday morning. His parents Christopher and Alison Mackie are currently with their son, who is now out of hospital with just cuts and scratches. Mr Mackie thanked the Turkish authorities "for their absolute dedication in finding" his son. They are all expected to return to their home in Radcliffe-on-Trent later this week.